No shirt, no shoes, no problem is the mantra for most New Zealand shops, restaurants, and supermarkets. 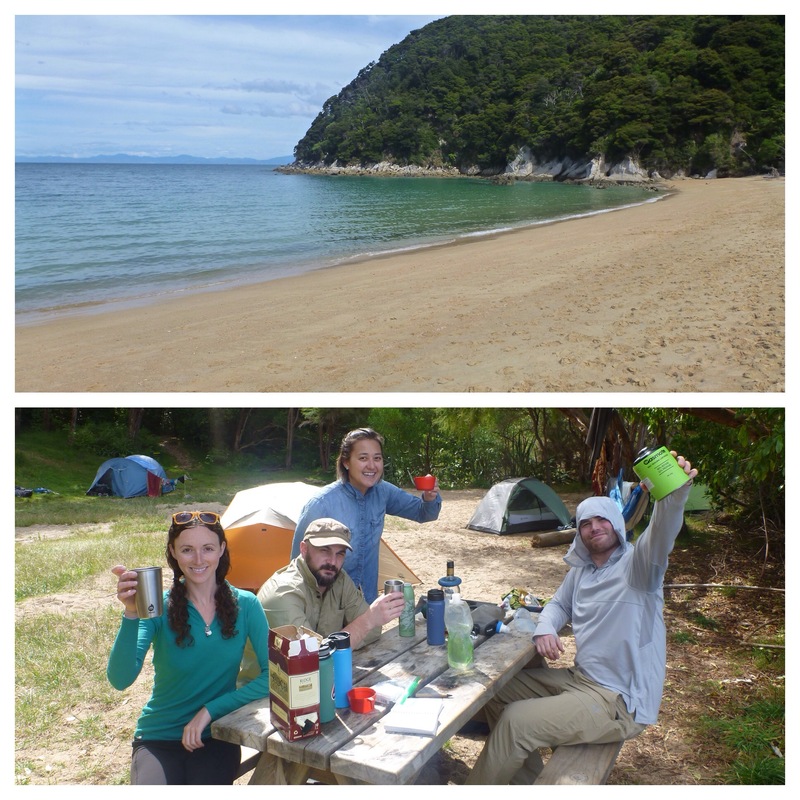 It is also the most fitting motto for trampers on the Abel Tasman track. 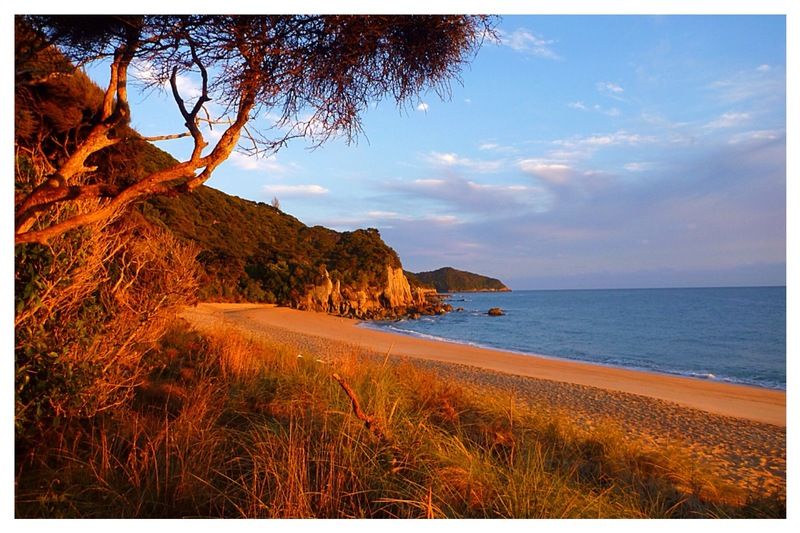 Touted as New Zealand’s best beach tramp–with sea kayaking, fur seals, and little blue penguins abound–the Abel Tasman attracts every type of beach lover, whether they know what tramping is or not. We started our trek in high winds under a dark sky, fearing the four-day forecast of nonstop rain. But NZ’s weather is like Seattle’s: completely unpredictable. By noon, the sun came out, the shirts came off, and so did the shoes when we stopped for lunch on a sandy spit and took our first swim in the Tasman Sea. 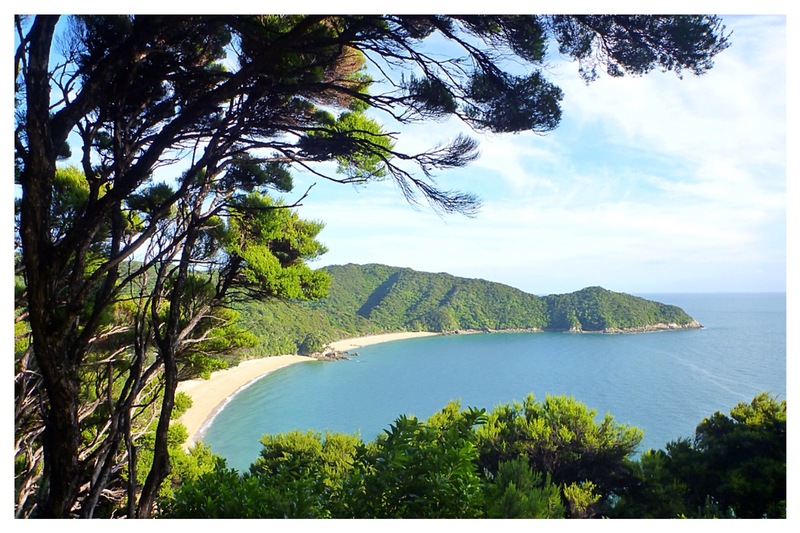 With a coastline dotted with campsites and huts, the Abel Tasman Coastal Track caters to almost any level of fitness and tramping enthusiasm. The 35-mile stretch of beach is also serviced by a number of water taxis, ready to take you to and from the start, finish, or wherever your dollar persuades them. 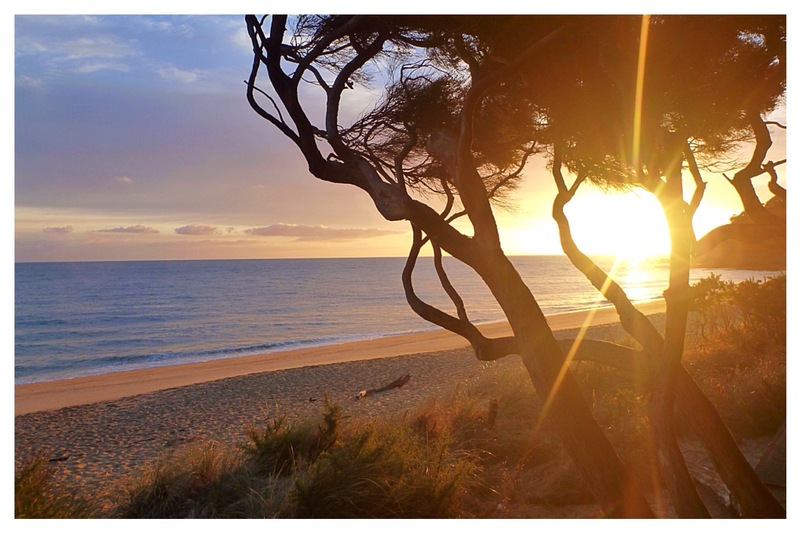 Our first, and most beautiful, campsite was on the bay of Te Pukatea, just beyond the very popular Anchorage Bay Hut and campsite. Although this intimate bundle of sites is a kilometer out of the way for a thru-hiker, the extra footsteps delivers a very high reward. For the first time since beginning our travels in New Zealand, K and I were not alone in our experiences. We had been joined by our American friends from Seattle (crew acronym name: JANKR). Suddenly, our tent site for two became a party of five and our meditative tramps in the park became a chatty caravan. As you do when good friends are around, we prepared for indulgence and debauchery. For the first time since Glacier National Park, I agreed to adding some unessential liquid weight to my pack: a three-liter bag of red wine. That’s like carrying around an 8-pound bowling ball, for fun. Approaching 50 lbs, the obscene weight of my pack was comical. Taking it off became a strategic plan for how I would eventually get it back onto my shoulders again. And it never went on or off unaccompanied by an assortment of uncontrollable grunts and groans. As every backpacker knows, the more days you hike, the more you enjoy the glory of feeling your pack weight drop with every meal consumed. The boys had equipped themselves with thick glass bottles of gin and rum, while N and I had joint title over the mysterious red blend. We went easy the first day, wisely rationing for our four days on the trail. But the weight of the wine quickly overcame me. Desperate to rid the extra pounds and walk upright once again, we drank it all that second night. 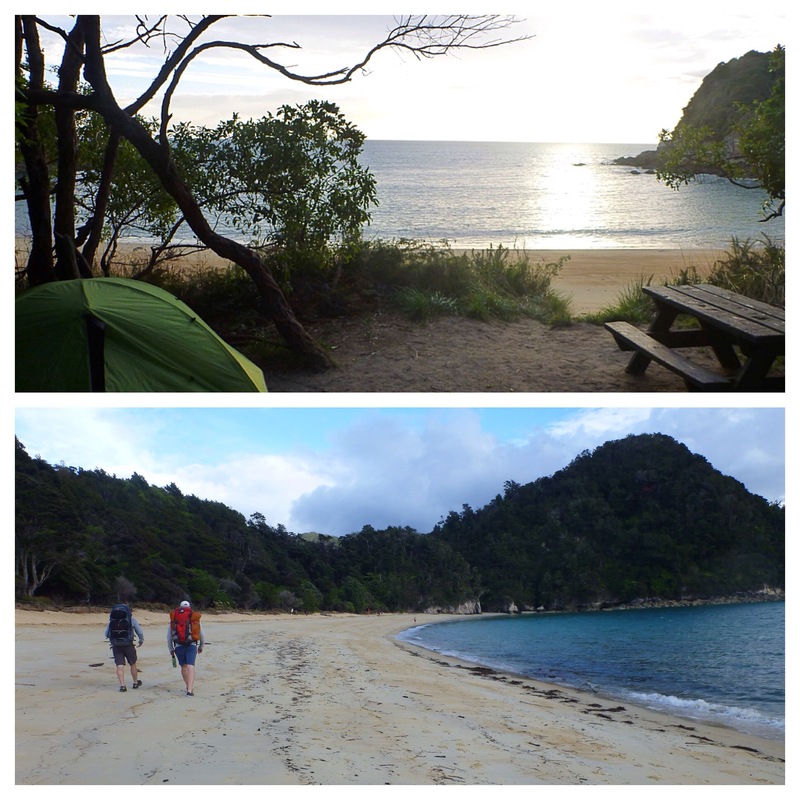 That second night we camped at Onetahuti Bay, roughly 39 km (23 miles) from the starting point, Marahau. Just as the daylight was fading and our JANKR crew was finishing the last of our libations, we noticed a young couple arriving to camp carrying little more than a half empty tent bag in their hands. We watched for a while as they struggled to set up an apparently broken or incomplete tent set. Curious as to their lack of provisions and tempted by the insufferable need to end their struggles with the tent, the men in our group went over to help. The struggling couple was young. Early twenties. German. Tourists, like us, but obviously new to trekking. We learned they were attempting to complete the entire track in a single day without camping, and didn’t even start until the early afternoon. “You realize it’s 60 kilometers? !” we pressed, astounded by their lack of preparedness. “Only 57 actually,” they replied, embarrassed but equally indignant. True, they had reached Onetahuti in good time, but were still 20 km from the end (which is an unserviced parking lot 10 miles from the closest town) at nightfall with no lights, no warm clothes, no food, and no way of treating water for drinking. A park ranger had apparently offered them an abandoned tent–which had only a rain fly and a broken pole set–and a single sleeping bag to get them through the night. And so there they were, learning a very valuable life lesson. But no need to worry about the foolish young couple. A solo (and overly equipped) traveler who spoke their language took them in and gave them food and water. And lucky for them, beach tramping in the summer is pretty benign. They survived the night, probably with little sleep and many sandfly bites, and hopefully with a few more pearls of wisdom. Don’t underestimate this track as just being a “walk on the beach”. Not only do you have to defend yourself against sunburn, heat exhaustion, dehydration, and sandflies, you have to time your walking with the tide. Obtaining a tide schedule from the DOC office before setting off is essential. 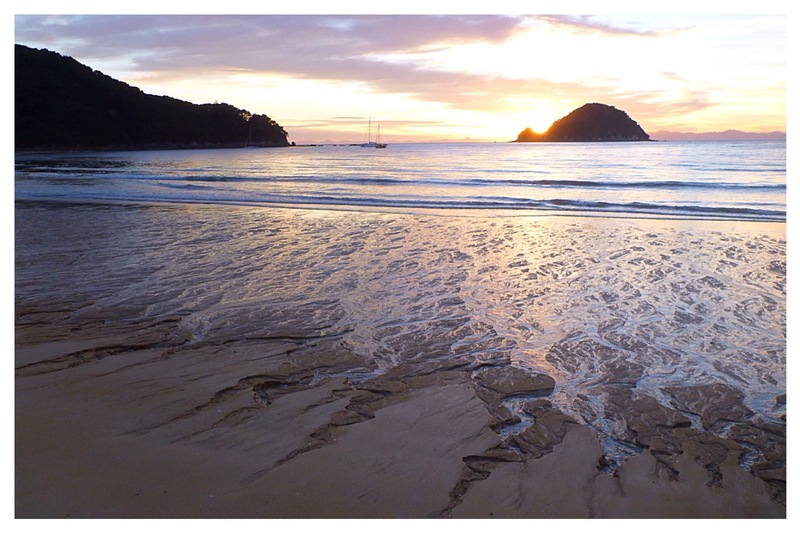 Our low tides times happen to be early in the morning, which forced us to witness the most gorgeous sunrises in order to make it across the tidal flats and avoid getting stranded. Of course, you also have to defend yourself (rather, your food) against critters–especially those cheeky, chicken-like birds called the Wheka which are apparently capable of walking off with a three-pound block of cheddar cheese. Sadly, the German couple were not the only novice “outdoorsmen” we observed being irresponsible trampers. Every mile on the trail, we picked up trash scattered by the hoards of tourists that came by water taxi. At every the campsite, we collected forgotten belongings from previous campers. And at every beach, we cringed as people would feed (aka poison) the wildlife for a photo opportunity. (As if anyone really needs a selfie with a seagull!?!?!) 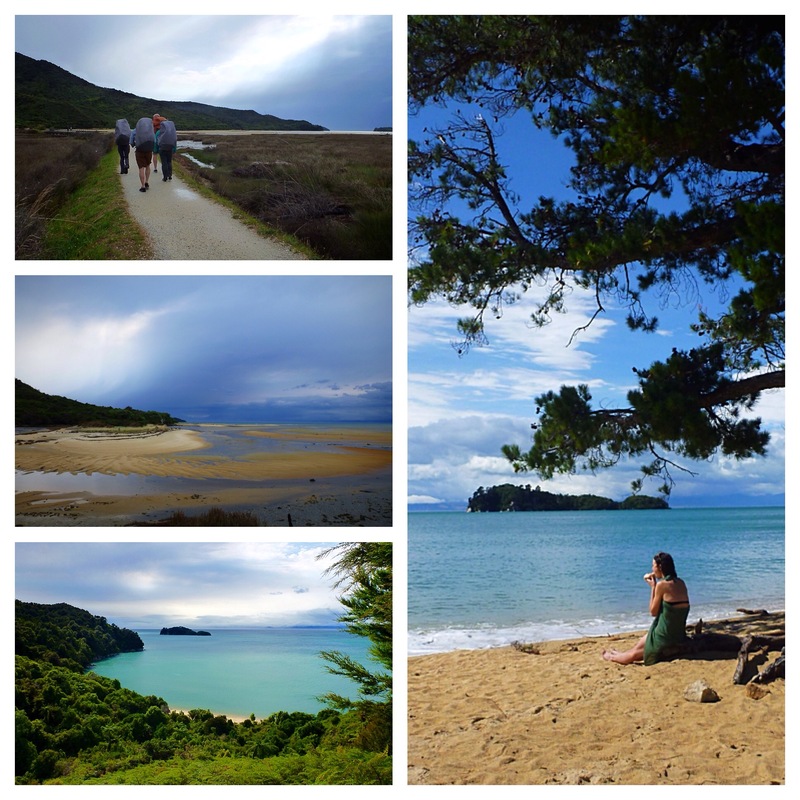 The Abel Tasman is undeniably beautiful, but it’s hard to not be distracted by the other people. 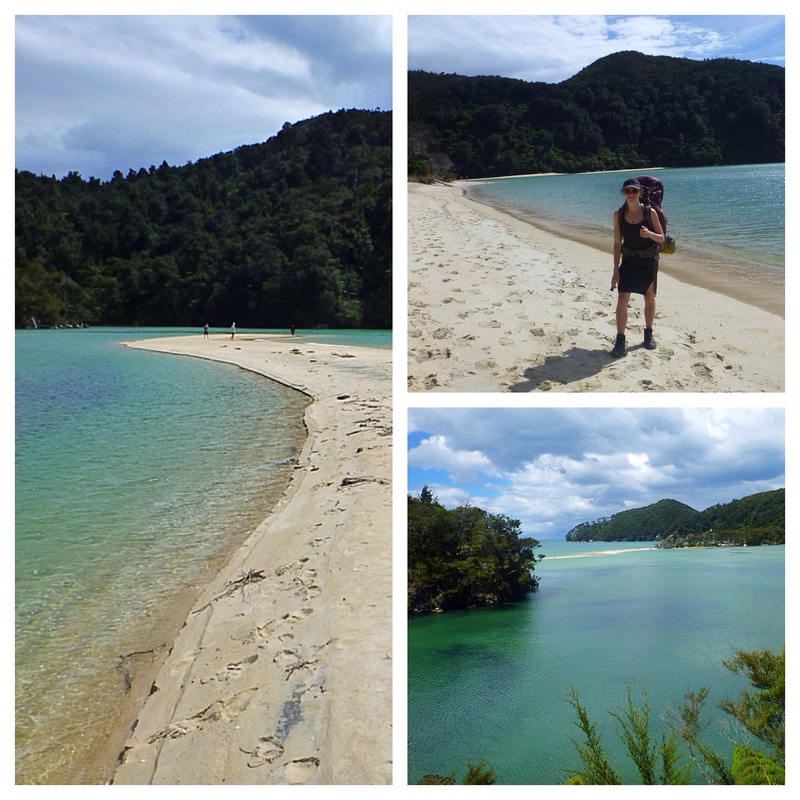 Whether overtly obnoxious or politely inconspicuous, people are a defining aspect of the Abel Tasman Track. In fact, we saw much more people than wildlife. (Contrast to my experience at Abel Tasman ten years ago, which is remembered with penguins, seals, and flocks of birds in every bay). Everywhere in the world, rapid tourism growth tends to bring destruction to places of natural wonder. Which is ironic given that it’s the natural beauty that draws the tourism. With tourism producing unfathomable amounts of waste, K and I have agreed to follow a new principle: leave every place visited a little cleaner than we found it. In some cases, we’ve carried glass bottles for days in search of the proper receptacle. But it doesn’t even have to be that hard. Just picking up one plastic wrapper or one aluminum can should make you feel proud. It’s an easy behavior that can be adopted by anyone. That way, we can all walk this earth with no shirt, no shoes, and no problems.